The published works in the fifties and sixties are personal favorites of mine. The deepavali malar’s especially had many pages dedicated for paintings with several themes explored elaborately. Today I present one such painting that was published in Kalki Deepavali Malar, It is interesting that in the later years, Rajam uses a more prominent outlines with ink, while his earlier works have only a suggestive outline. The depth and shades of colour obtained through his wash technique and the detailing makes this one of his all time best. ஓவியர், பாடகர், நடிகர், ‘சங்கீத கலா ஆசார்யர்’ எஸ்.ராஜம் அவர்களின் நூற்றாண்டு இந்த வருடம். அதன் தொடக்கமாய். வரும் வெள்ளிக்கிழமை, ஃபெப்ரவரி 8-ம் தேதி, சென்னை மியூசிக் அகாடமியில் ஒரு நிகழ்வு நடக்கிறது. அவர் நூற்றாண்டை முன்னிட்டு நிகழ்ந்த பாட்டுப் போட்டியில் வென்றவர்களுக்கு பரிசு வழங்கப்படும். அவரைப் பற்றிய ஆவணப்படத்திலிருந்தும் பல சுவாரஸ்ய காட்சிகளைக் காணும் வாய்ப்பும் உள்ளது. அவருடன் பழகிய பலரின் அனுபவப் பகிர்வும் நிகழ்ச்சிக்கு செறிவு சேர்க்கும். இவைத் தவிர, அவர் ஓவியத்தை முன் வைத்து ஒரு நாட்டிய நிகழ்ச்சியும் (நவ்யா நடராஜன்), அவருக்கு அஞ்சலி செலுத்தும் வகையில் இசைக் கச்சேரியும் (ரஞ்சனி காயத்ரி) இடம் பெறவுள்ளது. இந்த அரிய நிகழ்ச்சிக்கு அனுமதி இலவசம். கலை ரசிகர்கள் வந்து ரசிக்கும்படி வேண்டிக் கொள்கிறேன். இது தொடங்கி, இன்னும் ஓராண்டுக்கு மாதம் ஒரு கச்சேரி ராஜம் அவர்களைச் சிறப்பிக்கும் வகையில் பரிவாதினியின் மூலம் நடக்கவுள்ளது. முதல் கச்சேரியாய். ஃபெப் 22-ம் தேதி எஸ்.ராஜத்திடம் கற்ற பாடகர் அக்ஷய் பத்மநாபன் பாடுகிறார். The first half of the twentieth century saw the ascent of Tamil Print magazines. Several artists enriched these publications through their illustrations. Of which, five artists viz. K.Madhavan, Gopulu, Silpi, Maniam and S.Rajam left an everlasting impact. Each of the above-mentioned artists are unique in their own way. One can broadly say, Shri. S.Rajam was unique in two counts. He was not only a professional artist (Given the quality and the volume of his art works, he can only be classified as a professional artist) but also a professional musician with a full-time job at the All India Radio – Madras. The style that he chose to portray his themes, inspired by the traditional Indian fresco paintings and the oriental water wash technique. S.Rajam was born on 10th Feb 1919. His father – V.Sundaram Iyer was a lawyer and a connoisseur of music. S.Rajam in an interview has mentioned that music and painting were like his two eyes. If it was his father’s interest that spurred Rajam to take up music, it was the way his mother Chellammal went about executing even the smallest chores with an aesthetic and artistic touch that drew him towards art. By the time S.Rajam had joined the college of arts, he had also acted in the lead role of a then blockbuster movie – “Seetha Kalyanam” (He had acted in three other movies as well). His tryst with the tinsel world had invited skepticism from the then principal of Government College of arts and renowned artist/sculptor D.P.Roy Chowdhry . But it didn’t take long for S.Rajam to prove his mettle. He topped the course every single year and won the prestigious Dr. Rangachari scholarship. He even got a double promotion that helped him finish the six-year course in five years. During his college years, S.Rajam met Lewis Thompson – a poet and a follower of Ramana Maharishi. The acquaintance turned out to be lifechanging as Lewis Thompson introduced S.Rajam to the philosophy and concept of classical Indian art. Thompson’s words, “Art must represent nature; but not reproduce it”, became S.Rajam’s Tharaka Mantra. While the college course, inspired by the western view, focused on techniques for realistic portrayal, the Indian perspective was more symbolic and suggestive. An inspired Rajam would visit various temples and study the sculptures deeply to understand the portrayal and the philosophy behind it. The idea that the features of the Godly subjects in the sculptures were to depict “what is ideal” rather than “what is real” fascinated S.Rajam endlessly. Even before his graduation from the college of arts, it was clear to him that his works would be based on the classical Indian style. In 1939, Rajam met K.V.Jagannathan – the editor of “Kalaimagal”. Rajam’s first published work depicting a Guru and his disciple appeared in Kalaimagal the same year. It was the first of the many that would follow. By the time he graduated, his career as a musician had taken off reasonably well. After a short stint as the in-charge of music and dance for the celebrated dancer Ramgopal, Rajam joined All India Radio Madras. During his vacation and during the concert tours, Rajam visited places such as Thanjavur, Kanchipuram, Sittannavasal, Sigiriya and studied the paintings deeply. In 1945, he visited the Ajanta caves. The paintings in there proved to be a lifelong inspiration for Rajam. His illustrations on the themes based on literature, mythology and philosophy became a regular feature in Kalaimagal and other published works of K.V.Jagannathan. It was a matter of time that his works were sought by other publications such as Dinamani, Kalki etc. The special issues like Deepavali Malar gave him ample space to explore his subjects in depth. Rajam developed a style of his own drawing inspiration from the Indian frescos and combining it with the Chinese water wash technique. The distinct lines (rekhas) and his depiction of features such as eyes, fingers were clearly inspired by the Classical Indian frescos and the water color technique was based on the Chinese style. Although most of his works were on hand made paper, he has also done several works on surfaces such as wood, silk etc. The staggering feature of his paintings is the literal and figurative layers buried in them. The depth that he managed to create is the fruit of his arduous technique. His themes often required meticulous research. After research, he created the entire painting with the all details in his mind. He started off the paintings with a pencil outline depicting the central figure. The actual painting is done around this central figure thereby creating the required depth. He used layers of transparent colors. Each color is applied only to be washed away with water using a brush. Upon drying the next layer is applied and washed away. It is this series of washes and the combination of the colors that eventually gave the desired color scheming that was originally envisioned. After the application of the transparent colors, the opaque colors are applied over it. Finally, his characteristic ink outlines (rekhas) were done using a Fineliner pen. Clearly, this technique requires immense patience and (depending on the size) each painting can take from a few weeks to a few months for completion. It was Rajam’s disciplined approach and incredible ability to multitask that allowed him to simultaneously work on several paintings. It was his capacity to quickly mentally switch from one theme to the other, as the paintings were drying, was the main reason for the volume of work he could produce. It was in the early 1940s the Music Academy, Madras approached Rajam to paint the Carnatic music trinity. Rajam referred previous portrayals, studied written accounts and created the portraits. They were not just faces but had multiple layers in them hinting at their life events and their compositions. It will not be an overstatement to say that these portraits have reached an immortal status on par with the compositions of the trinity. His original paintings of the trinity on various surfaces and in a wide range of sizes can be seen in over hundred locations. Apart from the Trinity, he had done hundreds of paintings based on Indian classical music. He has painted portraits of several notable composers such as Gopalakrishna Bharathi, Annamacharya, Purandaradasa, Othukadu Venkata Kavi etc. His portrayal of the seven swaras based on Muthiah Bhagavatar’s book ‘Sangita Kalpadrumam’ is another masterpiece. He has meticulously depicted the features associated with each of the swara including the color, ornament, life span, flower, Vahana, Rishi, Devata, Nakshatra, Rasa, Weapon, food etc. If one studies his works chronologically, it can be inferred that he keeps modifying his works as he gets more and more details. This can be easily observed in his trinity as well as the Saptaswara paintings. He has also illustrated hundreds of songs of many composers. As a musician, he had a penchant for unearthing rare compositions. That had also driven him to portray some of the rare compositions of famous composers (e.g. 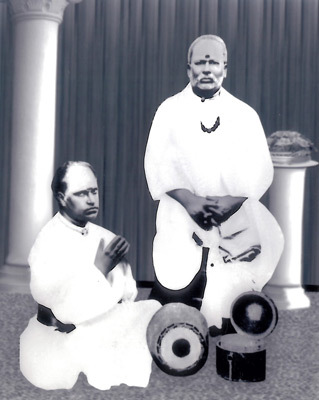 “Vidhi Chakradhulu and Dayaseyavayya of Tyagaraja). His other famous music-based works include the ‘Navagrahas’, ‘Panchalinga Kritis’ and the various forms of Ganapathi – all inspired from the kritis of Muthuswami Dikshitar. He also came up with a unique musical letter pad that had line drawings of about hundred classical compositions with a short description. Apart from music, literature and mythology proved to be great inspirations for his paintings. Thematic series including Dasavatara, Ashta Dikpalakas, Ashta Lakshmi, Sapthamatrika etc are some of his critically acclaimed works based on mythology. His art work has adorned several books. One fabulous example is the Scenes from the Ramayana illustrated in the Valmiki Ramayana Publication. Some of his works have also been compiled as books. Notable ones are the Chitra Periya Purana – depicting the legends of the 63 Nayanmars and the Thiruvilaiyadal Puranam – depicting the 64 divine plays of Shiva. Another book titled “Dancing with Shiva” published by the Himalayan Academy, USA has over hundred works of Rajam reproduced with exemplary production value. Although not in large numbers, Rajam has handled several contemporary themes as well. Even in handling such themes (e.g. a typical day in a South Indian Women’s life), his approach is true to his style. Despite achieving singular heights in multiple fields, Rajam was humility personified. He lived a simple and contented life. Greatness sat lightly on him. Money or fame were never his priorities. While he never sought for accolades, plenty of unique honors reached him. One example would be the preservation of his paintings in the time capsule built by the Kauai Hindu Monastery in Hawaii. Rajam passed away in 2010 at the ripe age of 90. He was seen painting even a week before his passing away.